Don’t wait until a holiday or birthday rolls around to order flowers for a loved one or friend. Show how much you really care by having flowers delivered to someone important when they least expect it. Flowers are much more than a kind gesture. They serve as an opportunity to send a special message to a friend, co-worker, lover, or family member. Think of all the people in your life who work long and hard to reach their goals. Whether it is graduating from high school or college, moving into a new home, having a baby or finding a job, there are plenty of accomplishments to celebrate. The best way to show how proud you are of your friends and family is to send flowers from Brant Florist. A gorgeous bouquet of fresh flowers means a lot more than a verbal “Congratulations!”. This is especially true of Brant Florist bouquets that are assembled by hand. Each of our bouquets also includes a personalized message to express your thoughts and feelings about the recipient and his accomplishment. Our Congratulations Flowers feature an array of visually striking colors that appeal to recipients in all demographics. Consider our Your Day Flowers in a Vase as a means of showing just how proud you are of someone important in your life. These white roses, yellow miniature carnations, alstroemeria, fressia and bright yellow Asiatic lilies will surely make your recipient smile. Our Blue Horizons in a Vase is another fantastic way to express congratulations. You will be hard-pressed to find more beautiful flowers. They are bright, fresh and aromatic. Your special someone will reflect back on his sacrifices each time he sees these congratulatory flowers. The bouquet contains blue and white blossoms like spray roses, Asiatic lilies and iris. If there’s a high school senior in your life who is set to graduate, show your congratulations by ordering some flowers for prom. We have congratulatory prom baskets, vases, corsages and boutonnieres. Our Rose and Chocolates Bouquet Vase is one of our most popular items. Featuring pale pink roses and lovely greens, this bouquet is presented in a translucent glass vase. An 8-piece gold container of Godiva Chocolates is added to express your congratulations. If someone in your life has recently had a baby, they would surely appreciate the delivery of fresh flowers. Our Baby’s First Block Cube is the ideal congratulatory gift for the parents as well as their little one. This arrangement consists of light blue delphinium, yellow mini gerberas, white spray roses and white waxflower. The flowers are grouped in an incredibly cute baby block with a blue liner. The delivery of fresh flowers is absolutely perfect for those going through a difficult stage in their life. Whether it is a death in the family, the loss of a job, the onset of sickness or an injury, sending flowers will certainly lift the spirits of the downtrodden. Consider our flowers for casket interiors. These pieces are classy and aesthetically pleasing. We also have a wide variety of crosses and hearts on easels and funeral home flowers. Your message to someone special becomes that much more powerful when it includes flowers. Brant Florist assembles each flower arrangement with an unparalleled level of care. We include a message that is custom tailored to your specific recipient. So don’t wait until the holidays or a birthday to express your love, gratitude or congratulations. Contact Brant Florist or order online to send someone a special message. Send a Little Luck this St Patrick’s Day with a Lucky Flower Arrangement! St. Patrick’s Day is right around the corner. Most people know that four leaf clovers are lucky flowers. However, this is not the only lucky flower. Though you might not stumble on a lucky flower as you go about your normal activities, you can brighten the day of your loved ones, friends or co-workers with a St. Patrick’s Day bouquet on March 17. This lovely bouquet will lift the recipient’s spirit and possibly bring about a stroke of good luck in the form of a new friendship, a romantic relationship, money or other discoveries. One of our most popular St. Patrick’s Day bouquets contains carnations. This flower’s history dates back over 2,000 years. Carnations are rich with mythology, symbolism and folklore. There is no doubt that carnations are some of the most beautiful flowers on the planet. However, few know that they are also associated with good luck and pure love. The ancient Romans and Greeks used carnations in garlands and ceremonial crowns. Today, the carnation serves as a gorgeous decoration and is widely thought of as one of the luckiest flowers around. This lovely flower is said to bring about happiness, peace and good luck. Place a morning glory beneath your pillow and you just might enjoy a refreshing night of sleep that is void of nightmares. Morning glories feature a bell-shaped bloom which is partially responsible for their reputation for brightening one’s day. Native Americans once used the flower’s leaves to make tea to alleviate indigestion and headaches. The sun flower follows the sun and is said to provide positive energy to those in its vicinity. This lucky flower makes a living space feel considerably brighter and safer. Go ahead and eat the flower’s seeds and you just might enjoy a string of good luck. Some say sleeping with sunflower seeds below one’s pillow inspires honesty amongst friends, family, co-workers and others. Peace lilies are said to reduce stress, generate soothing feelings, improve sleep and generally improve the lives of those who care for them. This flower is also a sign of good will. It features uniquely spiked leaves that exudes positive energy into a living or working space. Get your special someone a Shamrock in a Vase for St. Patrick’s Day and it will prove to be an unforgettable holiday. This vase shows off the green mums and hydrangea in all their natural glory. It is the perfect touch of Irish for anyone who deserves a stroke of good luck. Our Green Carnations are sure to bring good fortune to your significant other, friend, family member or other acquaintance. These stunning flowers come in a beautiful vase along with greens and a bow for the ultimate visual presentation. Perhaps our Top of the Morning in Vase would suit that special someone in your life. Filled with white and green blooms, this flower collection is certain to put a smile on the face of whoever you select as the recipient. Pick out a stunning lucky flower bouquet for your loved one or friend and we will assemble it by hand with the freshest flowers. Our talented florists take the extra step of personalizing the bouquet’s message to suit the recipient’s unique personality. If anything good happens to the recipient, you will surely receive the credit! Contact Brant Florist at info@brantflorist.com or 877-545-5535 to order some lucky St. Patrick’s Day flowers today. Who Should You Buy Valentine’s Day Flowers For? Valentine’s Day is right around the corner. This is the time of year when we express love for sweethearts as well as family and friends. Too many people think flowers are reserved for lovers. The truth is that there are plenty of deserving individuals who would greatly appreciate some Valentine’s Day flowers. Parents, siblings, kids and even friends would be extremely grateful for Valentine’s Day flowers. Keep all of your loved ones in mind this Valentine’s Day and take action. Have a bouquet of gorgeous flowers delivered to people you genuinely love. Whether it is a sibling, aunt, uncle, child, parent or other person, a delivery of fresh flowers is the perfect way to brighten their day. It is a small but incredibly meaningful gesture to show your appreciation. Express your gratitude to your parents this Valentine’s Day by sending some flowers. This is especially important for widows who won’t receive any niceties on Valentine’s Day. Do not hesitate to send your friends some stunning flowers, especially if they are not in a relationship. The delivery of beautiful Valentine’s Day flowers will certainly warm their heart on this special day. Think about those who mean something to you but live far away. Perhaps you have a cousin, brother, sister, stepparent or friend who lives across the country. Though you probably don’t see these loved ones as often as you would like, you can express your gratitude with the delivery of a colorful flower bouquet. Send some flowers from Brant Florist to remind them just how much you care. It is a small way to show your love and admiration for those who are important to you. Then there is the obvious: your significant other. Everyone loves a beautiful flower bouquet or arrangement from a lover on this special day. This is especially true of those who have a passion for all things beautiful, aromatic and fresh. Flowers are the best possible way to express your love. Imagine your sweetheart receiving a delivery of stunningly beautiful flowers on Valentine’s Day. Your significant other will think of you every time he or she looks at this beautiful bouquet throughout the remainder of the day. This is the type of gift that keeps on giving. Fresh flowers will brighten your flame’s day, show how much you care and most importantly, serve as a symbol of your love. You can make an even more powerful impact by having flowers delivered to your sweetie at work. It will come as a pleasant surprise in the midst of an otherwise boring work day. Order your Valentine’s Day flowers through Brant Florist and your recipient will be blown away. Brant Florist flowers are of the highest quality. These colorful floral combinations are elegant, fresh, aromatic and long-lasting. Yet Brant Florist doesn’t stop there. Each of our flower bouquets is handmade and personalized for each recipient. The special someone in your life won’t receive any old bouquet. Rather, he will receive a handmade arrangement with a custom tailored note. This is the personalized attention the special someone in your life deserves. There is no “one size fits all” approach at Brant Florist. Let us customize a flower bouquet for your recipient and they will enjoy an unforgettable Valentine’s Day. Are you on the prowl for a heartwarming gift that expresses your admiration and/or gratitude? Perhaps you simply want to let someone know you are thinking about them with something more substantial than a text message, e-mail or phone call. A flower arrangement is the perfect solution. Everyone loves receiving flowers, especially when they are fresh, colorful and aromatic. A floral arrangement received in the midst of a brutally cold and dreary winter really is a powerful pick-me-up. Christmas and the New Year’s celebrations are not far away. Most of us consider this to be the best time of the year as we are provided with the opportunity to spend time with our family and friends. Show those who mean something to you exactly how you feel about them with a lovelyChristmas flower arrangement from Brant Florist. ‘Tis the season to spread holiday cheer! Your gift of fresh flowers just might inspire the recipient to think of you in a different light or maybe even return the favor down the road. The point is that you build up some seriously positive karma by giving during the holiday season as well as the remainder of the year. It is a given that you will buy presents for your family members. Yet there are plenty of other people in your life who are also deserving of something special for the holiday season. Consider giving the gift of flowers to those who have helped you out in any manner throughout the year. Perhaps your child’s teachers went above and beyond the call of duty to help him excel in the classroom. Or, maybe one of your relatives who lives far away would enjoy a floral arrangement this Christmas or New Year’s Day. Even those who help make your daily life better in small ways are deserving of such a gift. We’re talking about mailmen, paper boys, garbage collectors, crossing guards, police men and so on. If you aren’t sure which flowers to pick out, don’t fret. We have a diverse array of stunning flowers that appeal to a wide variety of individuals. Consider our lovely Holiday Planter With Poinsettia. Rife with the colors of Christmas, this piece will invoke plenty of holiday spirit. OurRed and White Centerpiece with Twin Candles is our best selling Christmas centerpiece for good reason.With it’s red and white flowers and pinecone accents, this stunning arrangement defines Christmas and winter. 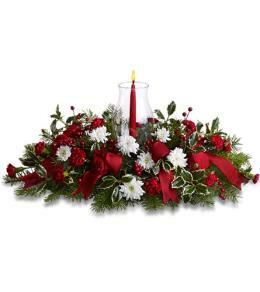 Buy one for your dinner table to add a festive feel to your holiday gatherings. 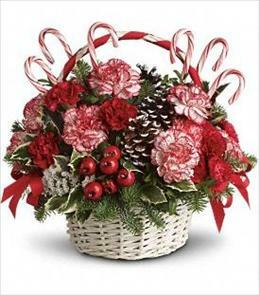 Order our Candy Cane Christmas Flowers for someone on your gift list and your recipient will be wowed by its beautiful colours and candy cane accents. Or send our Winter Elegance Bouquet to someone special, this beautiful arrangement with clusters of red berries is sure to put a smile on the recipients face. Our team goes the extra mile when it comes to assembling gorgeous flower arrangements. We hand make each arrangement with fresh and beautiful flowers. Our aim is to build only the most stunning floral arrangements possible, but we don’t stop there. Your gift is hand delivered by our experienced drivers delivering in all kinds of weather. We want to ensure the recipient receives their beautiful arrangement. If the recipient isn’t home, your gift may be left with a neighbour. Remember the cold weather is rarely a friend to flowers left on a doorstep. 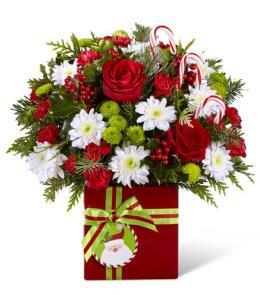 Order online or from your mobile device to send your Christmas arrangements this year. Simply choose your festive design, give us the address you want the bouquet sent to and the date you want it delivered and we will take care of the rest! We’ll also send you an email copy of your order, and a confirmation email once we’ve delivered your arrangement (and some Christmas cheer! ).